We have received many requests over the years asking to offer samples of our cage mixes and our specialty mixes. Here is your chance to give us a try!! 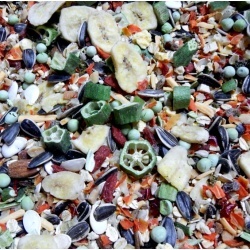 Once your Fid gets a taste of our nutritious mixes they will be TAILS UP for sure!! Shipping is included in the price of the samples. Your choice of ONE 1/4 lb Cage Mix from the list below. Just select which sample you would like to try! Your choice of TWO 1/4 lb cage mixes from the list below. Just click on the TWO samples you would like to try! Your choice of Three 1/4 lb cage mixes from the list below. Just click on the THREE samples you would like to try! Your choice of FOUR 1/4 lb cage mixes from the list below. Just click on the FOUR samples you would like to try! Our Cage Mix Sampler includes 1/4 lb of each of the following mixes. Your choice of ONE 1/4 lb specialty mix from the list below. Just select the specialty mix sample you would like to try! Your choice of TWO 1/4 lb specialty mixes from the list below. Just click on the TWO specialty mixes you would like to try! Your choice of Three 1/4 lb specialty mixes from the list below. Just click on the THREE specialty mixes you would like to try! Your choice of Four 1/4 lb specialty mixes from the list below. Just click on the FOUR specialty mixes you would like to try! 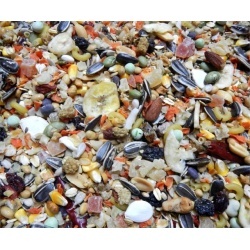 The Specialty Mix Sampler includes 1/4 lb of each of the following mixes. Your choice of ONE 1/4 lb Cage Mix from the list below. Your choice of ONE 1/4 lb specialty mix from the list below. Just click on the ONE Cage mix from the list and the ONE Specialty mix from the list you would like to try! Your choice of TWO 1/4 lb Cage Mixes from the list below. Your choice of TWO 1/4 lb specialty mixes from the list below. Just click on TWO selections in the cage mix list AND the TWO selections in the specialty mix you would like to try!